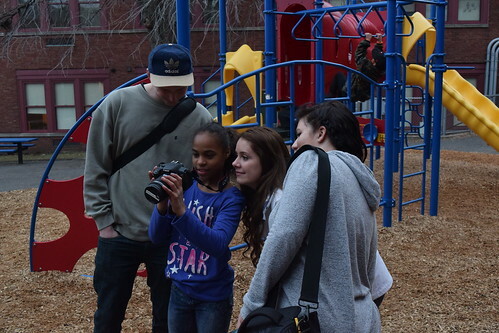 Our journalism class has set out to give the youth of Lincoln Park an outlet to share their stories. On March 21, 2016, our class met at the Lincoln Park Boys and Girls Club to put that plan into action. 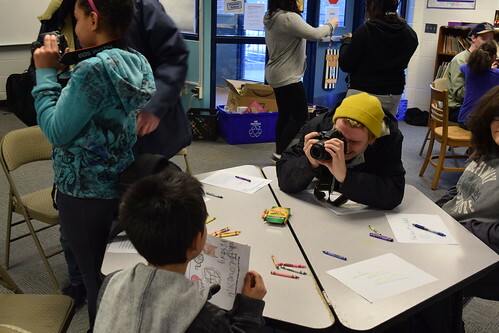 We hosted a photography workshop for the kids, mainly third- through fifth-graders. The evening began with the 12 of us, including our professor, John Hatcher, meeting in small, old room that doesn’t get much use anymore. As we tried to disregard the pounding on the door from the excited kids, we held a brief, last-minute planning session for the night. The majority of us had brought cameras, some personally owned, others rented from University of Minnesota Duluth. After we all became savvy with the equipment, we decided that we were going to share the cameras with the kids and let them take their own photos in Lincoln Park as we guided them. We adjourned from the small room and broke into groups of about three kids and one college student in the preteen center. The last thing we had the kids do before we went into the field was fill out a worksheet that asked them to draw and briefly write about what they liked most about Lincoln Park. Our idea was that they would then go take photos of whatever they wrote about. Roughly twenty minutes later, our class, 15 or so kids and a couple staff members walked a block to Lincoln Park, the actual park. As we walked, the kids took pictures of anything they thought was cool. Collectively, we accumulated over 100 photos. We got excited to get some photos when we got down by the stream, but all too soon we had to make our way back to the Club. We took a group photo with the kids back at the playground at the club and that was the unofficial end to our time with them for the evening. Our class met back in that small room and recapped the night. We all felt good about what we accomplished and planned our tasks for the week to come. We’ll be back at the Boys and Girls Club this Monday. Our workshop topic this time will be videography. Here’s a really intriguing interview with a local artist who has found her home in the northlands: Ennyman’s Territory interview. Anyone part of the West End’s maker revival? Whether we’re talking about contemporary art, homemade ketchup, 3-D printers, or artisanally-sewn bags and packs, Lincoln Park is a neighborhood where things are being crafted, and that’s something to get excited about. Check out these Denfeld students who are taking a stand against bullying and negativity in their school. “You don’t have to attend every argument you’re invited to.” Words to live by. Here’s a fascinating tool to look into the past of your home, your street, your neighborhood: the 1940 U.S. census records at the National Archives website. You can search or browse by address. Lincoln Park’s inhabitants included police officers, dockworkers, ministers, homemakers, bookkeepers, mechanics, schoolteachers, waiters and waitresses, salespeople, railroad conductors and engineers, bus drivers, and garment factory workers. Many had been born in Minnesota or Wisconsin. Others had been born in Sweden, Finland, Quebec, Ireland, Russia, Poland, Lithuania…or exotic Arkansas. Many individuals were recorded as lodgers renting a room in someone’s house or apartment, or someone’s relatives who had come to live with them–none of this “turn the spare bedroom into a home office” business; better to use it for housing an elderly grandparent or a brother-in-law looking for a new job, or for helping pay the rent. Some of the younger people recorded in the census may still be living in the neighborhood; others would be heading to Europe or the Pacific within a couple of years to fight in World War II, perhaps never to come home. These documents are precious to historians and genealogists because they’re snapshots of who was here on one April afternoon in Lincoln Park, going about their business.